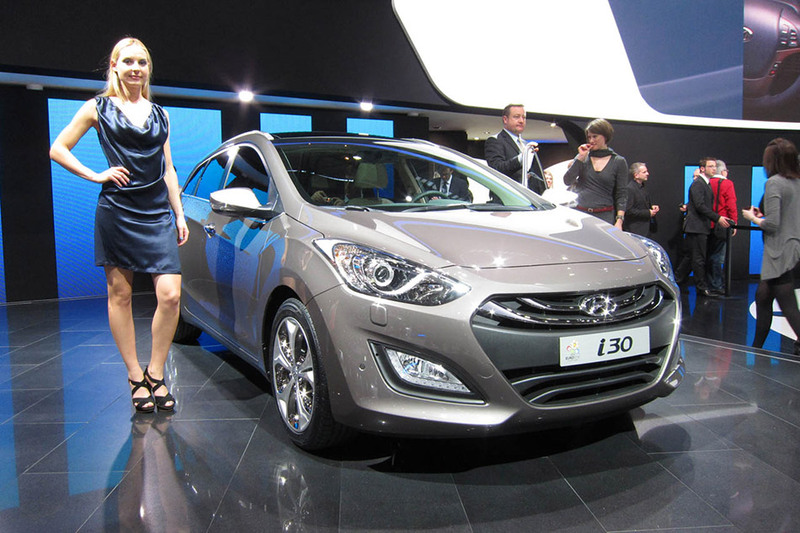 Following in the footsteps of the award-winning new Hyundai i30 Hatchback launched in March 2012, the i30 Wagon is the fifth new model that Hyundai has launched in the UK in 2012. Like the hatchback, the Tourer offers customers a stylish design combined with exceptional levels of comfort, refinement and efficiency with the additional benefit of increased luggage space. The Wagon adds greater load-carrying capability to the new generation i30's overall package, measuring 185mm longer than its hatchback sibling and offering 150 litres of additional luggage space with the seats up and 326 litres with the seats down. Load space is amongst the best in the class, with the all-new i30 boasting a larger luggage capacity than the majority of its key C-segment rivals. In addition, the Hyundai i30 Wagon has a greater luggage capacity than some D-segment estates with 528-litres available with seats up. With the seats folded fully flat this increases to 1,642 litres and for added convenience there are underfloor storage compartments too, adding to the Hyundai i30 Wagon's versatile nature. The flowing lines of the exterior, incorporating Hyundai's Fluidic Sculpture design language, make the Wagon stand out from the traditional and boxy estates. It boasts a sleek and sporty profile yet cleverly conceals a spacious interior. 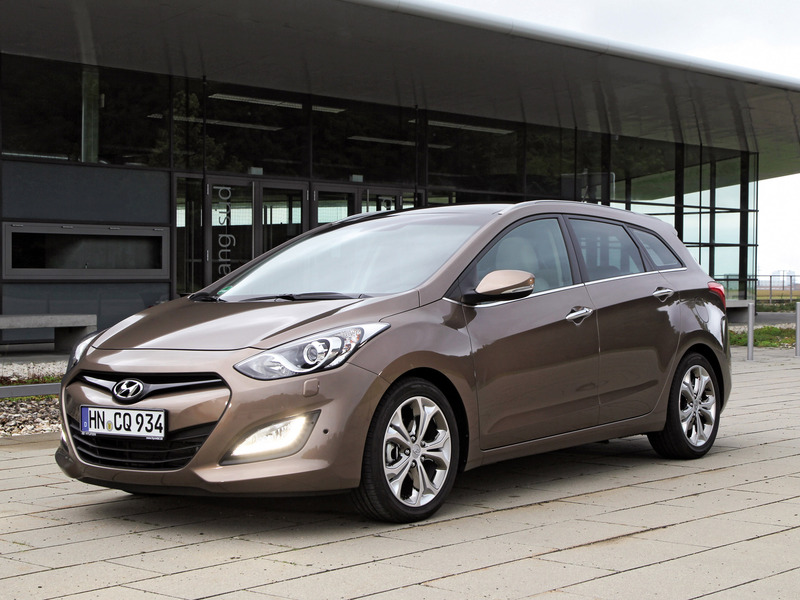 Tony Whitehorn, President and CEO, Hyundai Motor UK, says: "The New Generation i30 Wagon will help grow Hyundai's presence in the C-segment. The Hyundai i30 Wagon is able to meet the demands of both retail and fleet customers as it offers space and versatility along with a range of clean and fuel efficient engines. Running costs are also substantially lower, not only compared with the outgoing i30 Estate, but with key competitors too. Owners benefit from improvements to fuel economy and emissions plus VED and Benefit in Kind and some of the lowest insurance ratings in class." There is a choice of two engines in the range with customers able to choose either the 120PS petrol unit or alternatively the 1.6 CRDi diesel unit, in the form of a 110PS or a higher-powered 128PS variant. Both engines are coupled to a six-speed manual or automatic transmission. Versus the outgoing Comfort 1.6 CRDi 115PS i30 Estate, the Hyundai i30 Wagon Active 1.6 CRDi 110PS Blue Drive is 12 per cent more fuel efficient than its predecessor - returning 67.3mpg on the combined cycle - while emitting 11 per cent less CO2 at 110g/km. The versatile Tourer is expected to account for 15 per cent of New Generation i30 sales in the UK and provides both retail and fleet customers with a high-quality, stylish and efficient all-rounder. 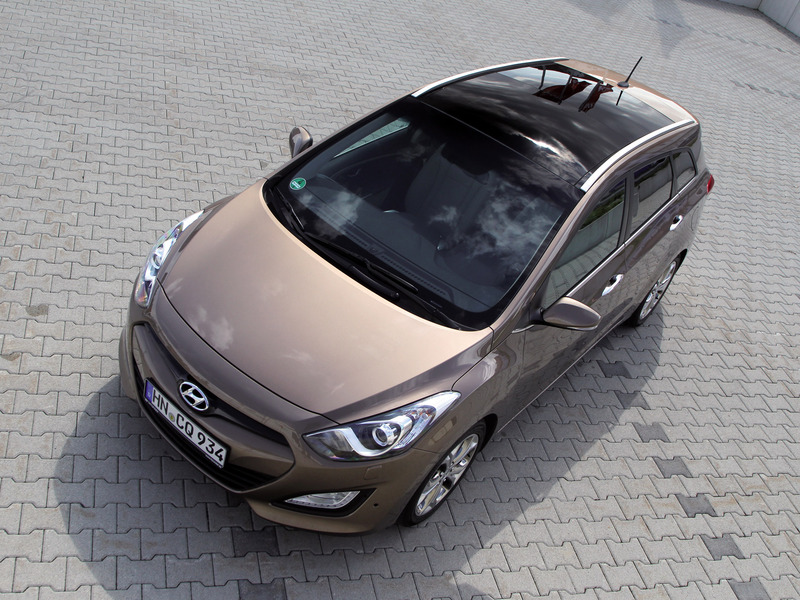 Similar to the five-door hatchback, the Hyundai i30 Wagon was designed and engineered at the Hyundai Motor Europe Technical Centre in Rüsselsheim, Germany, with production at Hyundai's manufacturing facility in Nošovice, Czech Republic. Pricing and specification for the Hyundai i30 Wagon with the entry level 1.6-litre 120PS Classic is available from £16,195 OTR, while Active trim starts at £17,295 OTR moving up to Style and range-topping Style Nav trims, which start from £20,095 OTR and £21,095 OTR respectively. The Hyundai i30 Wagon has been created from start to finish to provide customers with a stylish, efficient, spacious and safe estate. It is manufactured using Hyundai steel and robots to ensure maximum quality throughout and the belief in the product translates into one of the industry's leading vehicle warranty - the 5 Year Triple Care assurance package. 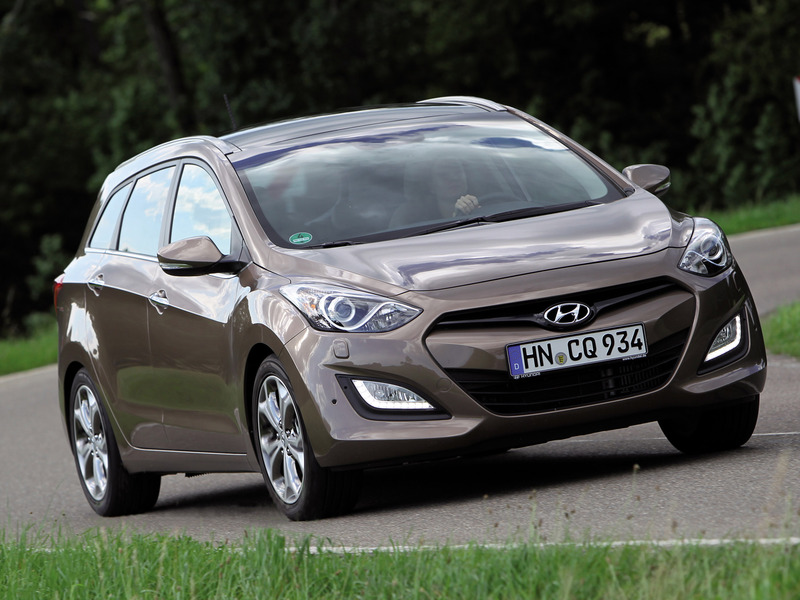 Whitehorn adds: "Like all new Hyundai passenger cars, the New Generation Hyundai i30 Wagon is backed by our renowned 5 Year Triple Care Package. This means owners benefit from exceptional aftersales back-up and total peace of mind as it includes a five-year unlimited mileage warranty, five years vehicle healthchecks and five years free roadside assistance." The Tourer was developed alongside its five-door counterpart from the earliest stages, enabling designers to fashion a coherent form that bears a strong family resemblance inspired by Hyundai's fluidic sculpture form language. Since its introduction on the Hyundai ix-onic concept at the 2009 Geneva Motor Show, fluidic sculpture has been the form language for all new Hyundai models launched in Europe. As with the five-door variant, the front is distinguished by Hyundai's hexagonal-shaped grille and jewel-like headlamps, but from the B-pillar backwards the Wagon differs significantly. The roofline extends rearwards over the flexible passenger/cargo area, sloping to add dynamism to the car's stance in keeping with the fluidic sculpture ethos of a stationary car appearing to be in constant motion. The overall height of the Hyundai i30 Wagon has been reduced by 65mm compared to the original i30 Estate, ensuring an athletic profile. The length has reduced by 15mm compared to the original model. Further enhancing the Tourer's dynamic appearance, a pronounced swage line runs horizontally along the sides of the body and rises all the way to the rear lights. The rear windscreen wraps around the C-pillars, increasing interior luminosity and benefiting visibility. The deep tailgate gives the car a clean look and opens to bumper-level for easy loading. 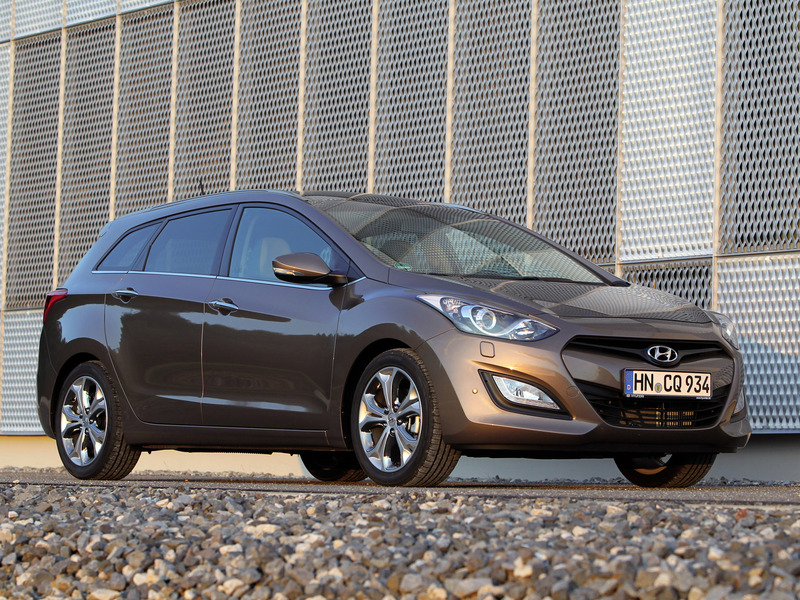 Similar to the hatchback bodystyle, the Hyundai i30 Wagon benefits from an increased track. The bodyshell is 5mm wider, and the front and rear tracks have also been increased, moving the wheels and tyres outwards to become flush with the wheel arches - simultaneously heightening the car's aesthetics and improving its road holding. The visual impact of Hyundai i30 Wagon on the road is also raised by the inclusion of standard LED daytime running lights flanking the grille. 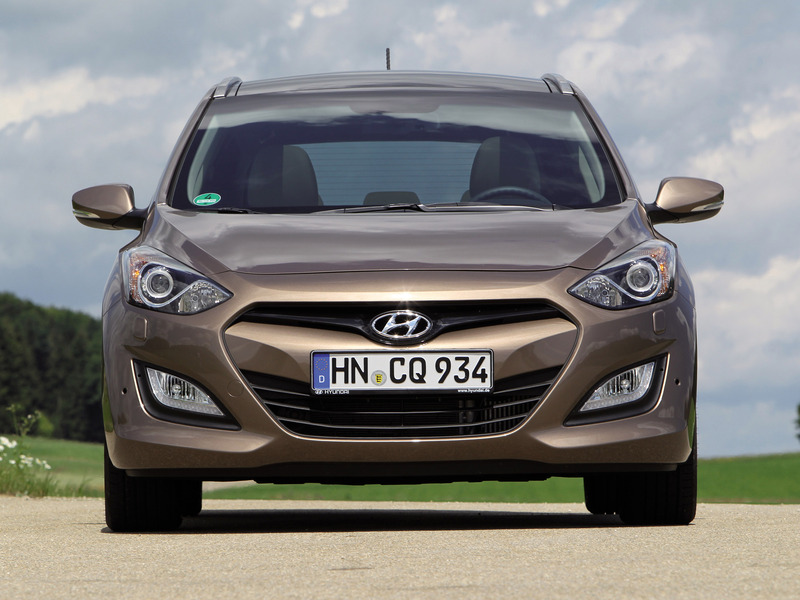 The new model also bears Hyundai's signature frontal feature - the hexagonal-shaped grille, with a choice of a single body coloured bar on Classic or twin chrome horizontal trim bars on Active, Style and Style Nav models. 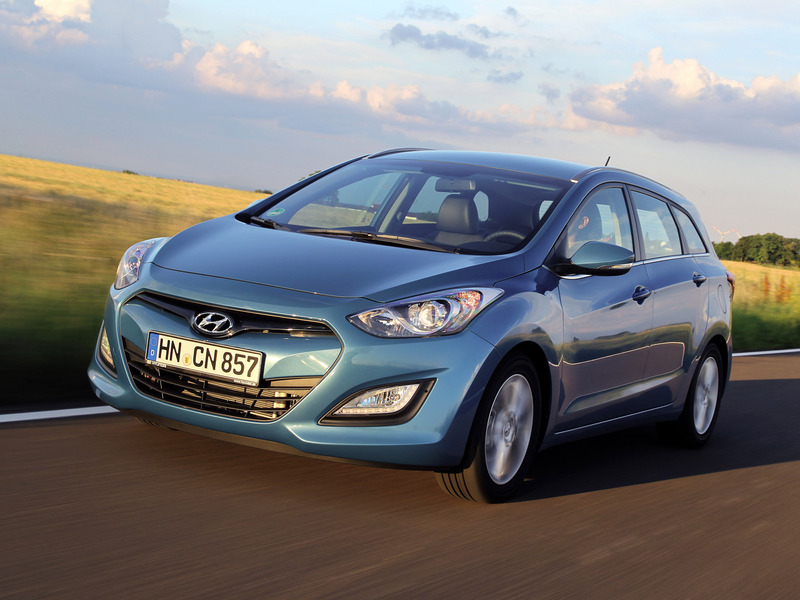 Hyundai is renowned for offering value-for-money products and the Hyundai i30 Wagon is no different. 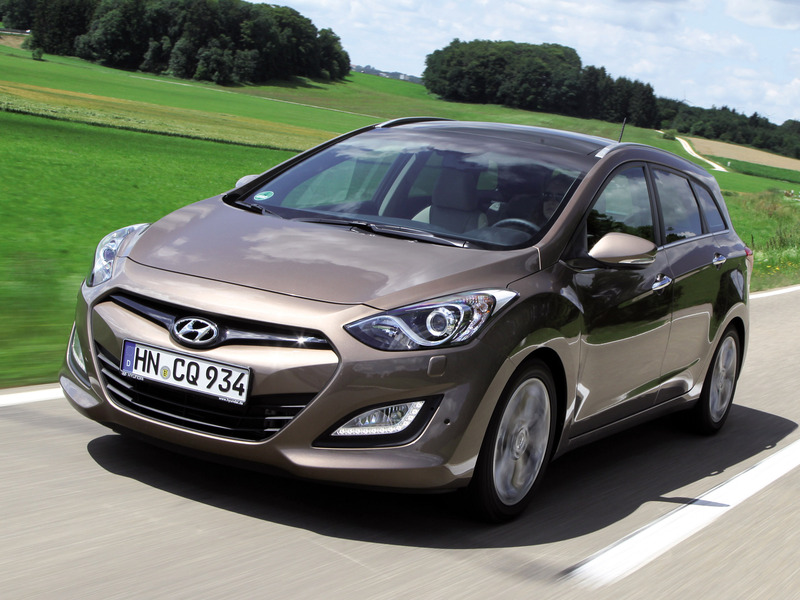 The modern premium feel of the i30 is complimented by a long list of standard specification. Features like air conditioning, LED daytime running lights, Bluetooth® with voice recognition, front electric windows, multifunction steering wheel, retractable load cover, roof rails and USB and Aux connections are standard from entry-level Classic. Active trim benefits from Hyundai's adjustable Flex Steer system, which allows the driver to adjust steering response between comfort, normal and sport settings. In addition this trim level also has rear parking sensors as standard plus 15-inch alloys, leather steering wheel and gear knob, cruise control and electric front and rear windows. Moving up to the Style trim, drivers get automatic headlights and front windscreen wipers, dual zone climate control and larger 16-inch alloy wheels plus front and rear parking sensors. The range-topping Style Nav comes fully equipped with all the above mentioned features but adds satellite navigation with TMC and a rear view parking camera with guidance system via the seven-inch touchscreen on the centre console. The Hyundai i30 Wagon will be available in the UK with a choice of two engines - one petrol and one diesel - with a broader range of power outputs, from 110PS to 128PS. The upgraded diesel engine - the highly-efficient 1.6-litre variable geometry turbo (VGT) 'U-II' unit - will be the most popular powertrain in the line-up. Generating 110PS at 4,000rpm and 260Nm from 1,900 rpm, the upgraded 1582cc engine will accelerate the Hyundai i30 Wagon from standstill to 62mph in 11.8 seconds, and go on to reach a top speed of 115mph - while emitting only 110g/km of CO2. A higher-powered version of the same unit is available and develops 128PS at 4,000rpm with an identical torque figure of 260Nm from 1,900 rpm. The additional horsepower helps the Hyundai i30 Wagon accelerate from standstill to 62mph in 11.2 seconds and onto a top speed of 120mph. Emissions are 115g/km of CO2 while returning 64.2mpg on the combined cycle. The 1.6-litre petrol engine offers an excellent balance between performance and economy and it capable of doing 0-62mph in 11.2 seconds and 42.8mpg on the combined cycle. Buyers of new generation i30 Wagon will be given a choice between manual and automatic six-speed transmissions, depending on model, with both units providing a refined driving experience and enhanced fuel efficiency. 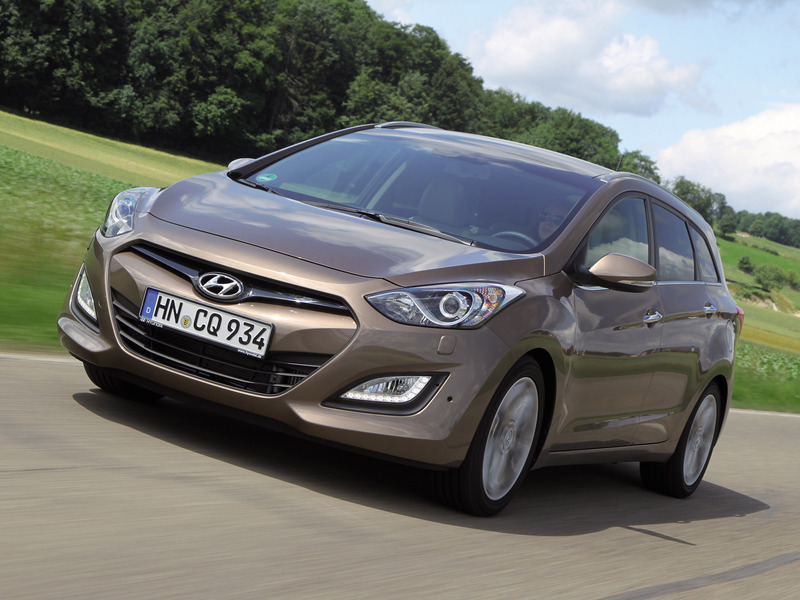 For the UK market, diesel is expected to account for the majority of Hyundai i30 Wagon purchases with 80 per cent of the mix. The six-speed manual transmission is expected to be the most popular choice with 76 per cent of buyers opting for this gearbox. The addition of Hyundai technologies developed under the company's Blue Drive™ sub-brand optimises efficiency and lowers emissions for the Hyundai i30 Wagon. These technologies, which are available on diesel models with manual transmission, include Integrated Stop & Go (ISG), low-rolling resistance tyres and an alternator management system (AMS). As part of its improved dynamics, i30 Wagon offers Hyundai's C-segment car buyers the new option of its innovative Flex Steer system. This introduces three operating modes - Comfort, Normal and Sport - and allows the driver to vary the level of steering support and feedback in order to best suit the current driving conditions. The Comfort mode gives greater electrical support, offering a 'lighter' steering wheel and minimal effort to reach full steering lock. The improved manoeuvrability makes city driving and pulling in and out of a parking space easier than ever. Normal mode is intended to be used most frequently. Offering the perfect support across all road types, its flexibility offers a relaxed, yet engaging drive. Finally, Sport mode offers drivers the most direct feedback from the road with reduced electrical support. The steering feels more weighted, offering a more driver-focused experience. The steering system employs electric power-assistance and requires 2.85 turns lock-to-lock for a 10.6-metre turning circle. Fully-independent, all round, Hyundai i30 Wagon's suspension features subframe-mounted MacPherson struts at the front and a multi-link set up at the rear - both with optimised geometry to exploit the wider track of the new model for enhanced handling and improved road holding. 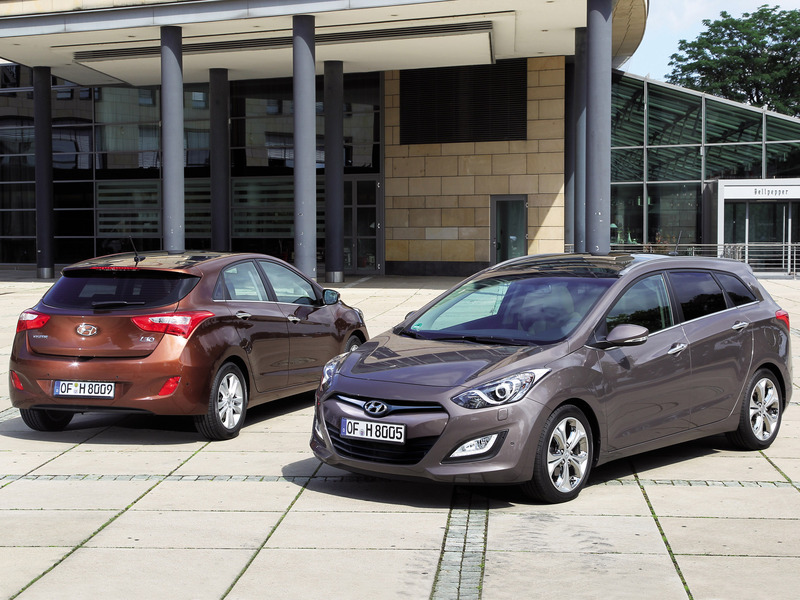 Occupants of the Hyundai i30 Wagon benefit from more spacious interior dimensions compared to the five-door variant, while greater trunk volume offers increased luggage capacity and practicality. Front seat occupants enjoy headroom of 1,033mm (+12mm compared to five-door), legroom of 1,067mm and 1,420mm shoulder room. Rear passengers enjoy significantly increased headroom (+38mm to 1,005mm) compared with the hatchback and improved access to and across the rear seats by a lower central floor tunnel (from 133mm to just 54mm). Trunk capacity in the Tourer bodystyle is increased to 528 litres with rear seats up, an increase of 113 litres compared with the original i30 (or 27 per cent) and one of the segment-best figures. In addition the Hyundai i30 Wagon's luggage capacity is not only one of the class-leaders it even trumps certain D-segment vehicles too. The boot extends to 1,642 litres when the seats are folded fully flat (an 18 per cent increase). 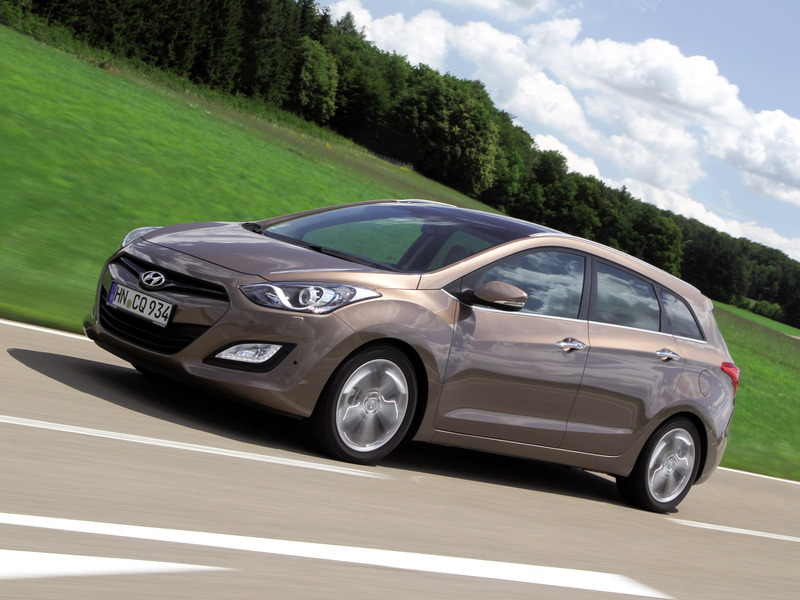 Hyundai i30 Wagon owners can also utilise an underfloor storage compartment, boosting the carrying capacity. Wheelbase remains the same as the hatchback model, at 2,650mm, but overall length has increased by 185mm to 4,485mm versus its five-door sibling. In terms of cabin refinement and NVH, Hyundai's new generation i30 Wagon engineering team targeted the segment leaders, to achieve significant improvements over the original model. Measures adopted to improve NVH included vibration damping engine mounts, fitting hollow drive shafts, stronger bodyshell joints between the sills and B-pillars, double-layer door seals, increased foam-filling in the A-pillars and re-shaped exterior door handles. Safety is a top priority for Hyundai and the new i30 Wagon features the latest active and passive safety technologies to ensure maximum protection for its occupants and other road users. Active safety features include ESP (Electronic Stability Programme), VSM (Vehicle Stability Management), ABS (anti-lock braking system), BAS (emergency Brake Assist System), HAC (Hill-start Assist Control) to prevent roll-back and ESS (Emergency Stop Signal) which flashes the brake lights when an emergency stop is detected. Good visibility is a key factor for safe driving and Hyundai i30 Wagon features LED daytime running lights to ensure it is seen. To maximise safety when reversing, a wide angle rear view camera is available (Style Nav only), showing a clear view of obstructions behind the car. In terms of passive safety, the Hyundai i30 Wagon's bodyshell structure employs a high percentage of ultra high tensile steel and features three new cross-members which link to the front or rear suspension mounts for maximized rigidity. The front door anti-intrusion beams have been strengthened, the joint between the B-pillar and roof is enlarged and the inner and outer side sill panels are manufactured in high tensile steel. Over 400 metallurgists are employed at Hyundai's steel plant in Korea to develop optimised steel recipes for every part and panel in our vehicles. As a result, the Hyundai i30 Wagon body-in-white has higher quality, higher tensile strength and lower weight than ever before. 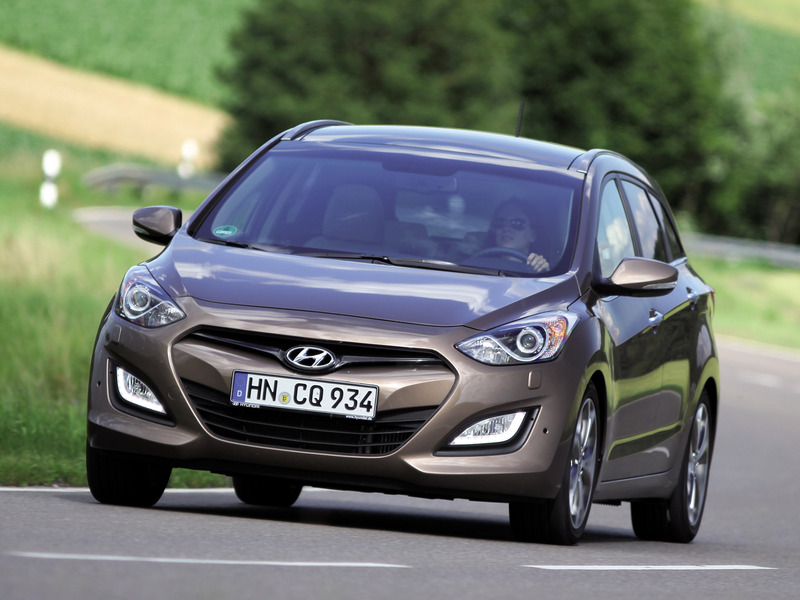 Hyundai is the only car manufacturer in the world to have its own fully integrated steel mill. 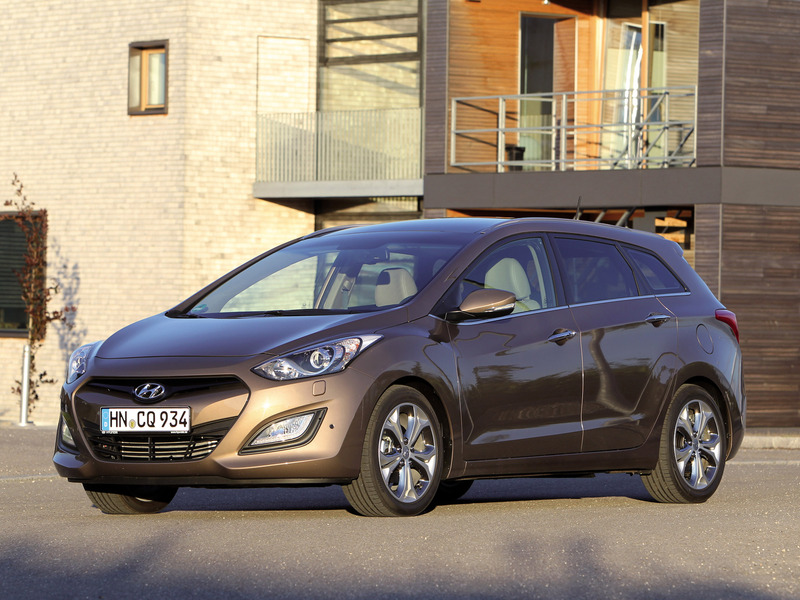 Each Hyundai i30 Wagon is fitted with six airbags as standard - front, front side and full length curtain. 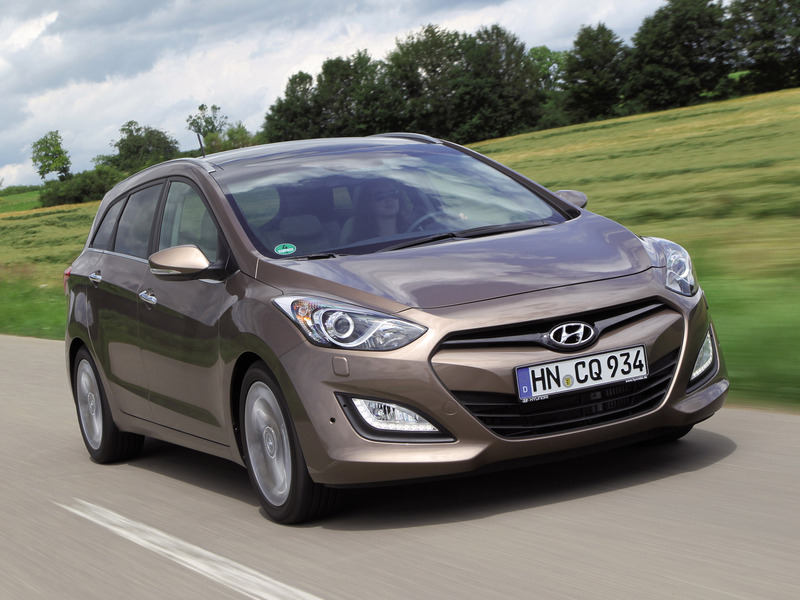 The safety features available on the new i30 Wagon reinforce Hyundai's excellent record for safety, and the company anticipates the new car will follow the New Generation i30 Hatchback and five other recent Hyundai models, in attaining the maximum 5-Star rating in Euro NCAP's impact assessment programme.